The classic color combination of red, black and white. Luscious. Add in a pop of green for freshness, and you have a real winner. This card is one my girls created at a recent Stamp-In Workshop. 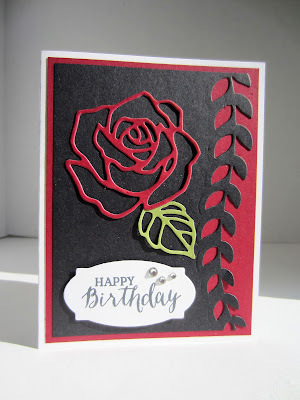 A pretty card, it is simple to make with the use of a few of Stampin' Up! 's innovative products. Here's how to re-create one of your own. Adhere a 4" x 5 1/4" piece of Cherry Cobbler cardstock to the card base. Run a 3 3/4" x 5" piece of black carstock through the Big Shot with the vine die from the Botanical Builder Framelits along one of the long sides. Adhere this over the Cherry Cobbler piece with the diecut edge along the open side. Be sure to keep an even border on the top, bottom and left edge. The diecut edge will then fall in place. 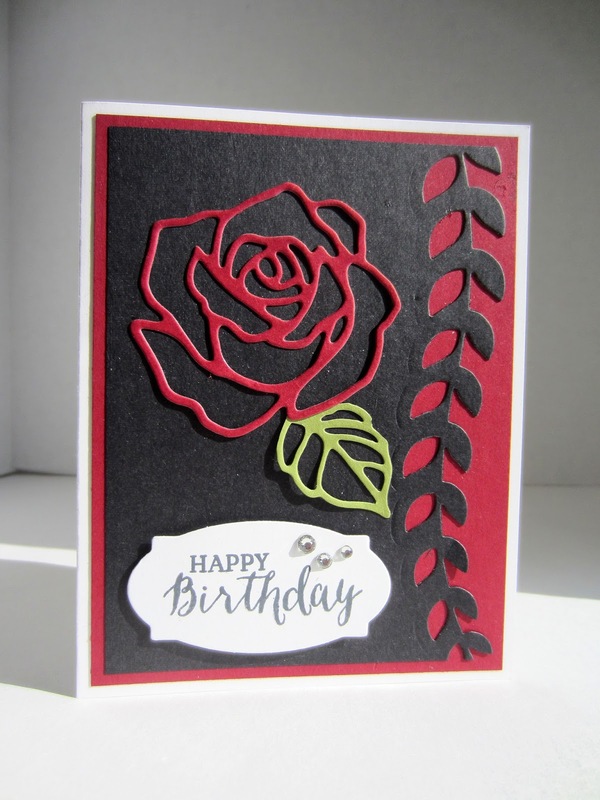 From Cherry Cobbler cardstock, cut one of the small roses from the Rose Garden Thinlits. Then, cut just a single leaf from the large rose out of Old Olive cardstock. Using miniscule drops of glue of choice, adhere the rose to the black piece. Then, after trimming the leaf, sneak it under the lower right portion of the rose, gluing it in place. On a scrap of Whisper White cardstock, stamp your sentiment of choice in black ink. Cut it out with the label Framelit from the Rose Garden set. OPTIONAL: Although I did not do it on my card sample, another option would be to stamp the label outline along with the sentiment. I think that would add to the feel of classicism. Use two Stampin' Dimensionals to adhere the label to the lower portion of the card. Add three Basic Rhinestones, one in each of the sizes. The wonderful thing about this card is that you could use it for virtually any occasion whatsoever. Please keep in mind that the Rose Wonder bundle (page 18) and the Botanical Builder Framelits (page 26) are both from the Occasions Catalog that expires May 31. Not much time to get yours before they are possibly gone forever! Stay tuned to my blog for a special announcement! I love the texture and it would be a keepsake! Love the contrast of the black background, and the rose is lovely! Thanks for sharing at #FridayFrivolity -- pinning and tweeting! What a fun card, I love the colors two of my favorite. Thanks for sharing on the #OMHGFF this past week!